FM 100 Pakistan is one of the most famous online radio station on the Pakistan. This radio station is playing Bollywood music and Adult Contemporary music 24 hours live online. 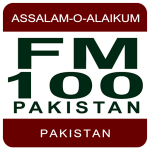 FM 100 is the pioneer of FM transmission in Pakistan. It broadcasts out of four cities, Karachi, Lahore, Islamabad Hyderabad,Rahim Yar Khan, Gujrat jhelum and Multan. has greatly influenced Pakistani radio broadcasting. Its first and only slogan is “Assalam-o-Alaikum Pakistan” which literally means “May Peace be on Pakistan.” It was founded on March 23, 1995 and has a listening area covering all of Pakistan. FM100 has gained immense popularity in a short span of time in the major cities of Pakistan i.e. Karachi, Lahore,Hyderabad andRawalpindi/Islamabad as it provide services in these cities. It has played a vital role in bringing about a change in their entertainment pattern but still needs some time and some efforts to immensely affect the radio listening habit of people. In Pakistan, the music played the dialogue and language used by the Djs, the conversation between callers and show hosts and the entire package and style of Fm100 shows of a new generation of Pakistan that is coming. Rahim Yar Khan and Multan stations are an addition to Fm100 Network and soon Fm100 will be available in other cities of Pakistan. FM100 radio channel has touched the Hearts of radio listeners in Pakistan. And in just few months’ radio is successfully attracting sizeable quality audience away from other forms of electronic entertainment media. Fm100 is the first 24hours live commercial radio station in Pakistan covering three main cities, Karachi, Lahore and Islamabad and surrounding areas, which accounts for the major portion of our urban population. FM100 radio channel continues to explore new ideas of amusement and entertainment to appeal a wide range of target audience we often consult our listeners to suggest new program formats so that we can cater according to the Public demands.